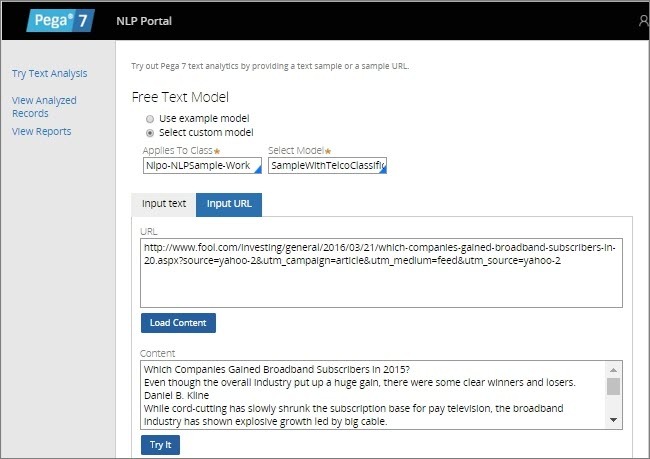 The NLP Sample is a reference application that showcases the text analytics capabilities of the Pega 7 Platform. The NLP Sample application includes the NLP Portal from which you can analyze text-based content, including news feeds, emails, and posts on social media streams such as Facebook, Twitter, and YouTube. This type of information can provide strategic insights and influence enterprise decisions. The NLP Sample application and NLP Portal are included in a special RAP script that you download and import through Designer Studio. This tutorial explains how to install the NLP Sample application and NLP Portal, and analyze the text-based content of tweets, Facebook posts, or YouTube metadata. You can use this version of the NLP Sample application only with Pega 7.2. From Designer Studio, import the RAP script that contains the NLP Sample and NLP Portal. Log in to the Pega 7 Platform as an administrator. In the Import wizard, browse your directory and select NLPSample_7.2.zip. In the Operator menu, select Operator. In the Application Access section, click the Add item icon. In the Access Group field, enter NLPSample:Administrators. Optional: Click the NLPSample:Administrators access group to make the NLP Sample your default application. Log off and log in again with the same credentials. In the Application menu, verify that your application is NLP Sample. In the Launch menu, verify that you can access the NLP Portal. From the NLP Portal, you can test the Pega 7 Platform text analysis functionality without having to complete any prerequisite tasks. For the testing, you can use the example text analysis model or any of your custom models. The example model is FTModels and its Applies-To class is Nlpo-NLPSample-Work. 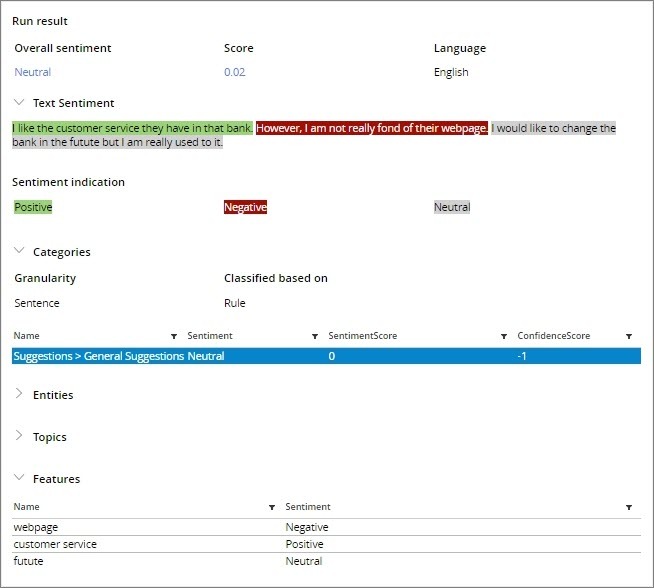 This model enables sentiment, classification, and entity extraction analysis. For the NLP Sample application, the model supports default telecom taxonomies for English, French, German, and Spanish. Open the NLP Portal from Designer Studio by clicking Launch > NLP Portal. The portal opens in the browser as a separate tab. In the NLP Portal, click Try Text Analysis. Use example model - Select this option to use the default text analysis model. This option allows you to test the text analysis functionality without the need to configure your own models. Select custom model - Select this option to use one of your existing text analysis models. In the Applies To Class field, select the class that the text analysis model applies to. In the Select Model field, enter the name of the model that you want to use for testing. Paste the text sample into the input field. In the URL field, specify the address of the text sample, for example, an online article. Click Load Content. The Content field is populated with the text obtained from the URL address. Click Try It to start the analysis process. Overall sentiment - The polarity level at the document level (that is, the expressed opinion in the document). The overall sentiment of the document can be positive, neutral, or negative. Categories - The predefined assignment of one or more classes or categories to a document or sentence that makes it easier to manage and sort. The categories are defined in the taxonomy that is part of the text analysis model. Entities - The keywords identified in the analyzed sample that belong to predefined categories such as names, organizations, locations, monetary values, and so on. Topics - Brand names or their synonyms defined in the text analysis model, for example, Apple, iPhone, Samsung, and so on. Features - The terms that are implicitly detected by the text analysis model as the talking point. In the sentence "I am not fond of their webpage as I cannot find anything there," the feature is the term webpage. Currently, feature identification is not supported. You can also use one of the sample instances of the Data Set rule (Facebook DS, Twitter DS, or YouTube DS) that are delivered in the NLPSample.jar file, but you must change its access details. The data sets do not work with the sample access details and can cause errors. Create an instance of the data flow rule to reference the free text model rule and to process the records handled by the data set. 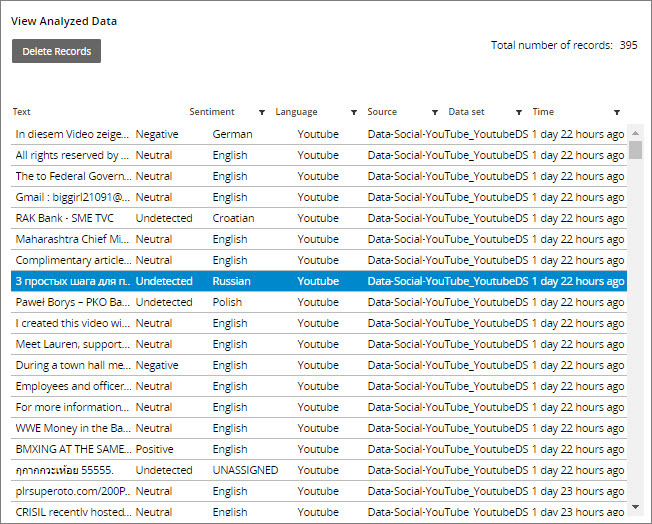 You can view text analytics statistics for each processed record. For the records to appear in the NLP Portal, activate the data flow that you created for text analysis and keep it active until it processes some records. In the NLP Portal, click View Analyzed Records. The list of processed records is displayed. Each record is is defined by a text excerpt, identified sentiment, language, source, data set, and time when the record was processed. Optional: In the Record Details window, click Previous or Next to switch between records in the list. On the View Reports page, you can examine statistics about the content from social media that was processed by the NLP Sample application. The accumulated data from all processed records is presented here in different charts that show the sentiment types, categories, and record types classified according to various criteria. Overall Sentiment Split - Shows the sentiment distribution for all processed records. Volume By Source - Shows the number of records per source processed on each day of the month. Volume By Category - Shows all categories identified by the text analytics model and the number of records (divided by type) for each category. In this tutorial, you have just completed text analysis of content from one of the social media streams (Facebook, Twitter, or YouTube). You activated a data flow that references an instance of the data set rule and free text model rule. The data set connected to an appropriate API and the Free Text Model rule conducted the text analysis. You have also analyzed the processed records in the NLP Portal by using the available analysis tools.